The House Of M Super-Scribe Brian Michael Bendis Makes His Marvel- And Only Marvel - In Exclusive Deal ! I thought this series was the story of Rose Jagger, a young woman raised to be an assassin in the employ of organized crime. But somehow the tale has detoured to a larger stage more fitting its title, and Rose has been left behind in favor of her sometimes-partner, Val. In the aftermath of the mob’s assassination of a sitting POTUS, the nation is thrown into chaos. With a dystopian future on the horizon, organized crime sees an opportunity. Sides are chosen as secrets are revealed, and Val finds himself at Ground Zero for the dawning of this new day the mob has made. I pondered last time about how this entire storyline was going to be wrapped up this issue. Without giving too much away, it won’t. There is a sequel series on the way that will continue the narrative. Honestly, I think it’s a big cheat on the part of the writer and publisher. They said it’s a six-issue series, but clearly they planned from the get-go it for it to be longer. Such marketing nonsense hardly instills confidence, and makes me less likely to even consider the follow-up series. 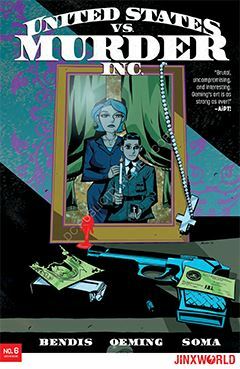 As usual, the artwork is Michael Avon Oeming’s over-stylized cartoony artwork. I won’t disparage his storytelling abilities, but I find his rendering style akin to high school notebook doodles. I would expect a writer of Brian Michael Bendis’ stature to have his pick of collaborators. I would hate to think he actually chose Oeming as his illustrator.